Anthologies are a tricky endeavor. We all know the classics like Creepshow 1&2, Tales From The Darkside and Twilight Zone. Then there is VHS 1&2 which put a new spin on the art of anthology film making. But none of them, with the exception of Creepshow, have made an impact quite like Michael Dougherty's Trick 'r Treat and since its release has been the gold standard for current anthology filmmaking. Trick 'r Treat has stood alone for some time because the entire story unfolded on one single night, Halloween. But thanks to a group of extremely talented film makers, dubbed The October Society, that no longer is the case. Tales of Halloween is what I, as both a horror and Halloween fan, have been waiting for since the release of Trick 'r Treat. A follow-up film that takes my favorite holiday and weaves a tale that is broken up into individual, but overall unified, stories. I must admit that I was very apprehensive that the film wouldn't live up to the hype I was creating in my head, but the moment the opening sequence started I new I was in for an awesome ride. The film opens with a beautiful title sequence and score that rivals, and surpasses, many movies in the horror genre. The opening really sets the stage, visually and auditorily with an animated flyover montage that is like a pop-up book and a theme that is just beyond wicked. before anything, though, you are hit with the soothing sound of Adrienne Barbeau's voice. She is our narrator who will guide us through each tale and she does this The Fog style from a radio station. There are ten shorts in all and, production wise, none of them falter. The casting for each segment is excellent, they pulled together so many genre favorites and veteran actors it's almost unbelievable. The atmosphere built in each short with its score and cinematography is amazing. There are too many to list here, but I want to commend every single person who worked on this film. They all pulled together and created something truly special. The practical FX are outstanding and is what every genre fan desires in a horror film. The monsters look like real monsters and the blood flows gloriously. I'm glad to see that there was no skimping on the FX front. There are a few spots where CGI is used, but it is hardly noticeable and doesn't take away from the film. The minute details will delight horror fans with their nods to John Carpenter, Evil Dead and countless more. This is a great companion piece to Trick 'r Treat, but also stands on its own as a solid solo watch. It is far better than many of the current anthology features that have been released as of late. 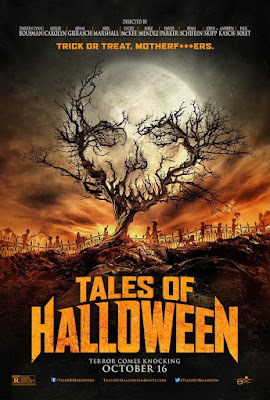 Tales of Halloween does what many horror films have tried to do, but failed, and that's capture the essence of Halloween. Written and Directed by David Parker.